Scandal – something that is shocking, upsetting, or unacceptable. How can it be, that this Liturgy tonight is a scandal? We present several things which are scandalous to a lot of people. We claim that at the Last Supper, Jesus turned the bread into His Body and the wine into His Blood. The Protestant Reformers could not accept 1500 years of unbroken Christian tradition and instead declared that either Jesus’ Presence left the elements after Communion, or that this is a simply a memorial meal – Do this in memory of Me. To many Latin Catholics, it was — sometimes still is — a scandal that we use raised bread for Communion instead of a flat wafer. Don’t you Byzantines know that the Last Supper was on Passover? To the ongoing dismay of non-believers, Jehovah’s Witnesses, Jews, and Muslims, we believe what the Gospel says tonight: Jesus, knowing that He had come from God and was going back to God the Father – that He is what the Nicene Creed says He is – fully divine, fully human at the same time from conception onwards to today. Those people are scandalized that we believe that Jesus is both God and Man. And we see scandal in the behavior of those ordained men – Judas betraying his Master with a kiss; Peter and the others all saying they would stand by Jesus no matter what, but at the moment of crisis, they all run off into the dark; Peter not only runs away, but at the house of the high priest, he denies our Lord three times – so much for the first pope! Most of the Christian East follows the tradition in John, whereby the Last Supper was not the Passover meal, but one of the meals done beforehand, and so raised bread would have been used. The Latin Church and a couple of other Eastern Churches, mostly under Latin influence, follow the Synoptic tradition that the Last Supper was on Passover and so matzoh would have been used: flat bread. The human frailty shown by Peter and all the others who run away or deny Jesus is preserved by the gospel writers – why? To give an accurate history, one must show the good and the bad. To inspire us to holiness, it is affirming and consoling to see that those who became great missionaries and saints were just like us and reacted like we often do when we run away from God and the teachings of the Church. And it should be a permanent reminder to all of us to never get proud of how wonderful we think we might be – when it comes to crunch time, we might very well not be so wonderful. Now, for the Eucharist being the true Body of Christ. In the sixth chapter of John, Jesus states this very bluntly – and many of the disciples and the crowd abandon Him as a result. Jesus did not care if people left – He did not come to win popularity contests. “‘I am the living bread which came down from heaven; if any one eats of this bread, he will live for ever; and the bread which I shall give for the life of the world is my flesh.’ The Jews then disputed among themselves, saying, ‘How can this man give us his flesh to eat?’” (John 6:51–52). Jesus considered this teaching so important that he was prepared to maintain it even if it meant all his chosen disciples were to leave him alone. He uses words like chew, and gnaw, like grinding meat off of a bone. Lots of people bolt at this point – this is crazy talk as far as they’re concerned. Saint Peter, though, speaking for the twelve, confessed his acceptance of it: Lord, to whom shall we go? You have the words of eternal life. Also we have come to believe and know that you are the Christ, the son of the living God. He gives glory to the true Body born of Mary – the Body of Jesus as preserved in the consecrated bread in tabernacles all over the Catholic and Orthodox world. He tells us that eating Holy Communion gives us a taste of what heaven will be like, and he emphasizes that link between the Last Supper, Jesus’ death, and His resurrection. All are tied together. On this night, Jesus the Son of God but also the Son of Mary, consecrated the bread and the wine. All of the covenants which God made with His Chosen People from Abraham on were sealed in blood, the life force. This new covenant is sealed in the blood of our Lord. As Man, He is a son of Adam, though sinless and preserved from sin, and so His blood ratifies this new covenant. As God, He is the Eternal Word, Whose blood delivers us from the curse of original sin and so reopens paradise to humanity. If Jesus Christ is not the Eternal Word of God and the human child of Mary, we are not saved. This is what the Church worked out for 450 years, finally being settled at the council of Chalcedon, defining that Jesus has both human and divine natures, united in one unique Person. St. Augustine says: Recognize in this bread the body that was hanged on the cross. Recognize in this cup of wine the blood that gushed out from his pierced side. Take and eat the body of Christ, since in the body of Christ you have become Christ’s members. Take and drink the blood of Christ. To counter your tendency to disunity, eat that body which is the bond of your unity. So as not to appear to be without value in your own eyes, drink that blood which is the price that was paid for you. When you eat this food and drink this wine, they will be transformed into your substance. Equally you will be transformed into the body of Christ, if you live in obedience and faithfulness. And then he says this: begin to receive what you already begin to be. And it is this unique Person that we are invited to receive, to eat and drink, to let into us, to open ourselves up to in a way that no one else can duplicate, no matter how close they are to us. Jesus comes to us to touch our body, our mind, our soul, and to change us into Him while still being me. This holy Sacrament, the holiest of all the Sacraments, has the power to change us. By coming tonight, we affirm our belief in this all-important mystery, and we receive what we want to become – part of the Body of Christ, here on earth, and then in heaven. In Eucharistic miracles, the bread becomes living flesh, the wine real blood. And everywhere that such a thing happens, when the blood is tested in a lab, the blood is always AB, the type found in only 4% of the world’s population, the blood type which can be given to anyone safely. 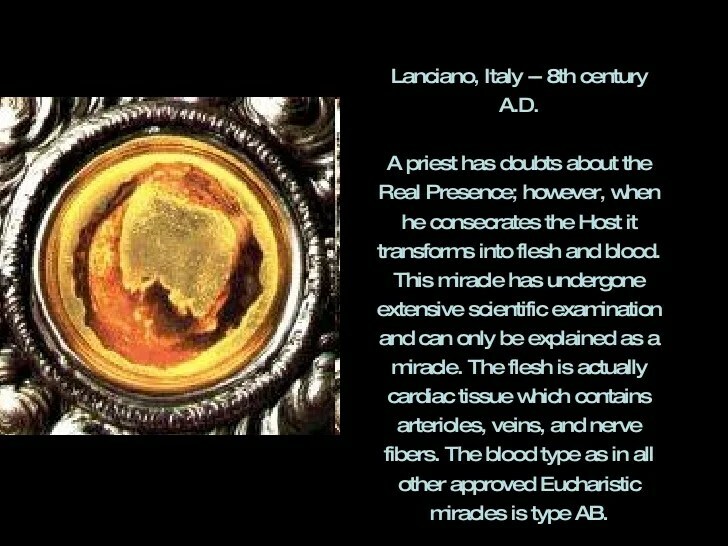 The blood from the miracle in the 8th century at Lanciano, the blood on the Shroud of Turin, the blood from the miracle in Argentina in the 1990s, all of that blood is AB. The flesh that is tested turns out to be cardiac tissue which contains arterioles, veins, and nerve fibers – tissue from the heart, the heart which pumps the blood, the heart which was pierced when Jesus died, the heart which gave off copious amounts of blood and water – John says that it gushed out of the wound – the heart which loves us so much, the heart that wants to speak to our hearts. All moments of consecration are awe-inspiring – but listen carefully tonight to the words – Jesus said explicitly This IS my body, my blood. Every tiny crumb, every little drop is the fullness of Jesus. Do this in memory of me – isn’t it clear that this is just a memorial meal like so many Christians and Jehovah’s Witnesses say? Well, the bible was not written in English, it was in Hebrew, Aramaic, Greek. And among the Jews, to remember – zikaron – is to make something present and real. When Jews use zikaron at Passover, it means that at each Seder meal, the original exodus from Egypt is made present to everyone at that table. When the gospel was translated into Greek, the word the Church used for in remembrance/ in memory of Me is anamnesis, a transfer from the heavenly world to this earthly world. So, we are both participating in the original Last Supper, and we are witnessing the transfer of Christ from the heavenly realm to our material world – and thus the gifts are transformed. When the tabernacle is opened, the servers bow down. When the Eucharist is carried through the church at the Presanctified Liturgy everyone is down on their knees with heads bowed. When you pass a Catholic church, you make the sign of the cross because Jesus is there, inside the tabernacle. If you’re a man, you lift up your baseball cap or hat as a sign of respect to Who is inside that church. This most holy Eucharist is placed on our tongues – and from there each time, in each person, billions of times over the last 2000 years, Jesus begins a journey into that person’s blood stream, into their tissues, their organs, their nerves, their brain and their feet. We become true living temples of God. When Scottish Catholics in the Highlands received Holy Communion in the 16 and 1700s it was expected that the person would withdraw from human contact and speech with others as much as possible after the end of the Mass, for as long as a couple of days, in order to be attentive to the Lord within and to commune with Him, to listen to Him, to talk with Him. We can’t do that as much – but we can indeed pull back a little and take time on Sunday or whatever time we receive Communion and listen to Him speak to us, and talk to Him in a different way than normal – for the Lord is truly with us then. You call me Teacher and Lord, and you do well in speaking this way, for that it who I am. If then I, your Teacher and Lord, have washed your feet, you should do the same for one another. I have given you an example, so that as I have done to you, you should do for one another. Here is the final point for our meditation. Jesus changes the whole structure with that act of washing the dirty feet of the apostles. They were upset because this was the job of the lowest servant or slave in a house, because streets in the ancient world were filthy with garbage, droppings from animals, even raw sewage. When the bishop washes feet in the cathedral tonight, the men who are chosen have washed very carefully – not so that first holy Thursday! They didn’t know Jesus was going to do this, so Peter was rightly upset. But this is also important: we have to serve each other. The pope is the servant of the servants of God. We are to serve each other, we are to love each other. No matter what our title – pope, bishop, priest, doctor, scientist, attorney, teacher nurse; no matter what our relationship -parent, child, brother, sister, uncle, aunt, cousin, nephew, niece or friend – we are servants of each other in Christ Jesus. We are to love one another in Christ Jesus, transformed by our participation in the Eucharist! We are to live with one another in Christ Jesus. One of the scandals of the early Christians was that owners, slaves, nobility and ordinary workers all participated in the one eucharist, at the same time, mixed together, with no seating by rank or occupation, united in Christ Jesus – we are truly one in Him, a lesson sadly lost many times. As we take the next steps in the life-giving passion and death of our Lord, may we do so united to Him and to one another in absolute love.